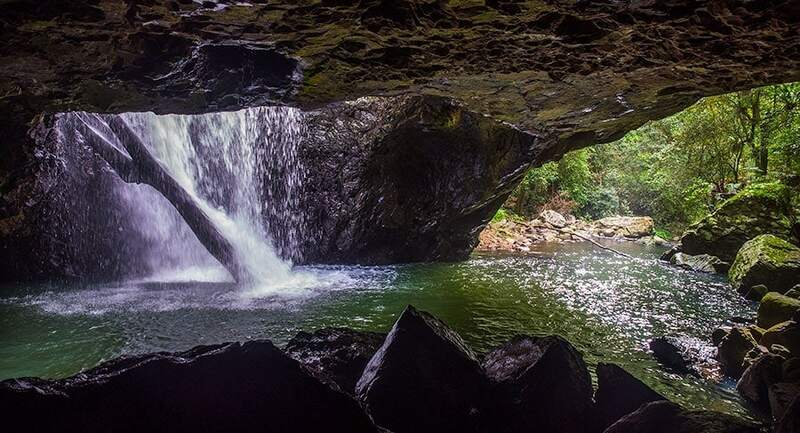 This weekend we headed down to the Gold Coast Hinterland to the Natural Bridge, an unusual waterfall structure formed millions of years ago in this protected World Heritage area of the Gondwana Rainforests of Australia. 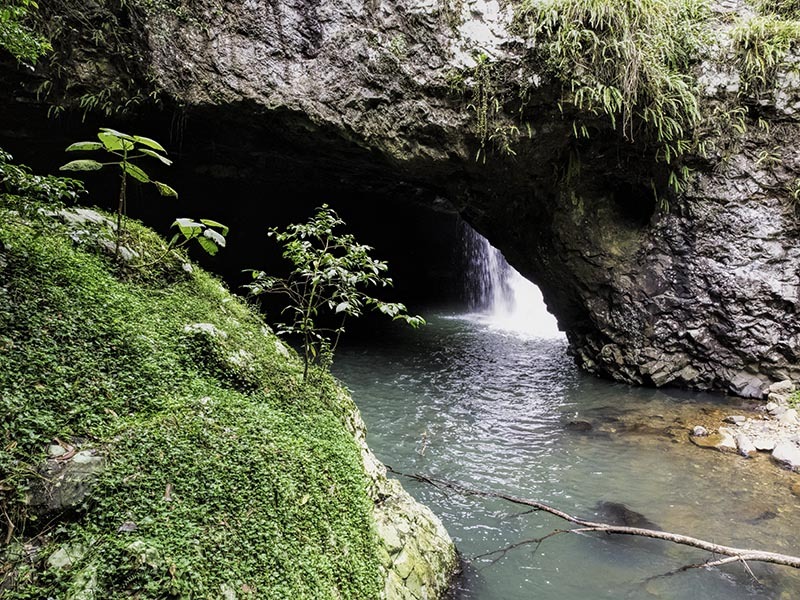 If you’ve heard locals referring to an area called the Natural Arch, this is the same as the Natural Bridge and is the name we knew this area by when we first visited some 14 years ago. The two names still seem to be used interchangeably but its now officially the Natural Bridge. We weren’t far into the track before we first heard the rushing water, we’d stopped at the Hinze Dam on the way up and knew it was spilling water over the wall which is great news as the Natural Bridge is fed from the Nerang river. We knew it would be a spectacular flow once we got down to the river and waterfall. To protect the area the 1km loop track is now paved along the full course and barriers and handrails have been installed to stop people straying off the path. This is for visitor safety to prevent accidents with many people visiting after dark and to protect the glowworms and other wildlife that live in the area. If you are looking for one of Australia’s many walks in fully natural surrounds and solitude this isn’t it but I would still recommend seeing the Natural Bridge, it’s beautiful and unique. A short distance into the track you choose whether to go clockwise or anti-clockwise. The track is paved and only 1km long so it isn’t difficult for most people but you are walking to the base of a waterfall so you’ll go down and up hill along the way. If you go clockwise you will go down the steps and up the slope, anti-clockwise is the reverse. I went anti-clockwise because I always prefer to climb than descend steps, particularly uneven ones. A little further down the path and it branches again, follow it first to the left. This will take you to a lookout over the hole at the top of the cave with the rapidly flowing river spilling into it. You can no longer walk across the Natural Bridge so back track up the path and continue on to the left. Your Natural Bridge experience will vary with the season, while the water flows all year round it will be more dramatic after wet weather or when the dam is spilling. 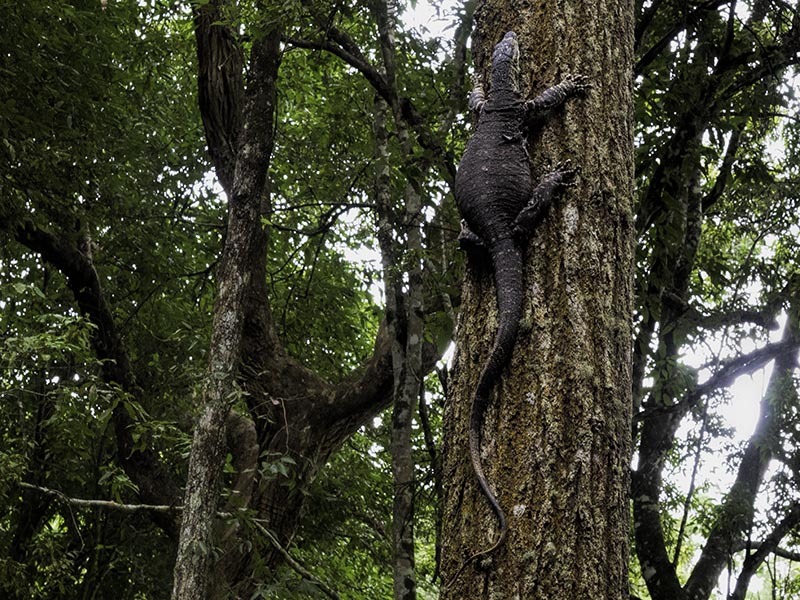 The natural forest around the area is always good for spotting local wildlife including large goanna like the one below but we find bird life is more varied and prolific during the late autumn and winter. Dawn will always get you the best bird sightings if you can get up that early. After wet weather the fresh fragrance is wonderful and is one of my favourite times to be in the Australian rainforest. It’ll be less busy then and with the path being paved you don’t even need to worry about having to clean the mud off your walking shoes. 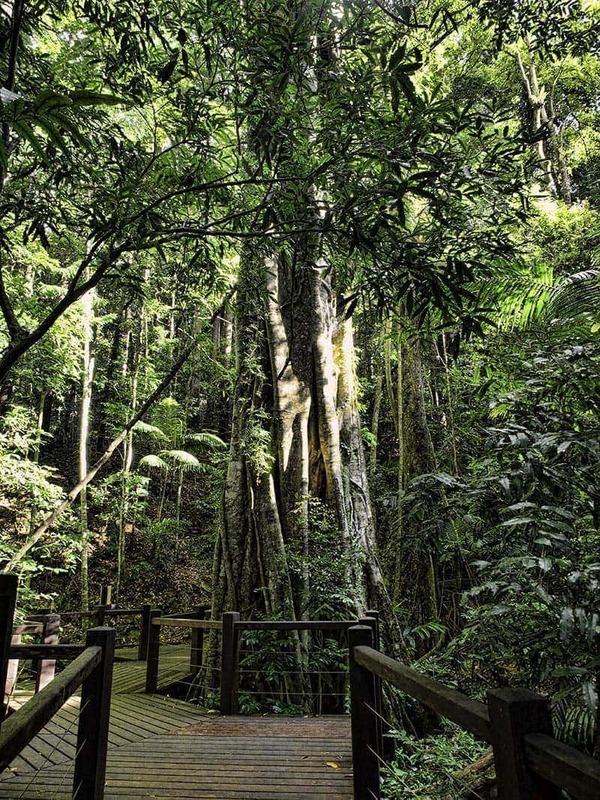 In mid summer the track offers a welcome shaded walk but it can feel quite humid with the level of moisture in the air, the rainforest here get’s a lot of it’s rain in the summer wet season. In summer you’ll also notice that the area is alive with an almost deafening chorus of crickets. Further along the track you’ll cross a bridge over the flowing waters then reach a viewing platform where you can see the river flowing into the hole over the cave from the other side. With all the light reflection from the water and darker heavy forest surrounding it getting the light balance right in a photograph can be challenging and often one side or the other will give better results. Particularly if like me it was your second trip out with a new camera and you accidentally flicked the wrong lever early in the walk and didn’t notice. Oops. Thank goodness for Lightroom and Photoshop, the photo’s aren’t good but at least they give you some idea of what to expect. Climb up a few steps from the viewing platform then begin a gradual decent down to the cave. Inside the cave if you go to the far end and look up for a while you’ll see micro-bats flying around in the day time, you’ll need to give your eyes time to adjust to the light, but they are so adorable. In the evening after sunset if you came down here you’d see the glow worms lit up. 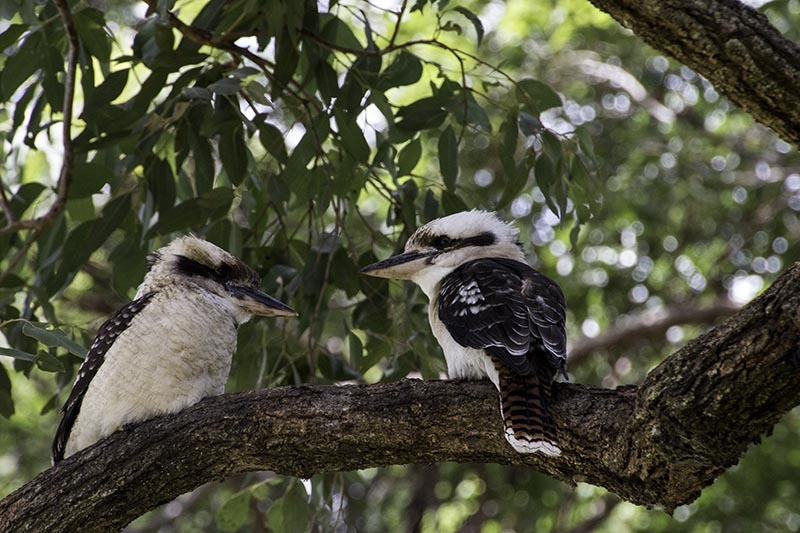 It’s the largest colony in Australia and well worth checking out. If you’re not confident driving out there in the dark there are tours run most nights from the coast. To protect the unique wildlife in and around the cave visitors are asked to stay on the tracks and avoid flash photography or torches because they can disrupt the natural eating and resting cycles of the glow worms. You are also asked to not smoke as they are super sensitive to it and it only takes a very small amount of smoke to kill them. There are several great viewing and photography points in and around the cave. From here you follow the track back across a bridge downstream and begin the short climb back up the hill to the carpark. Swimming isn’t allowed at the Natural Bridge but if seeing the river has made you want to take a refreshing dip there’s a Forest Park Rest Area a few minutes back down the road. If you walk past the picnic area and follow the path at the back it’ll take you down to the river and a great swimming hole. Even better is that hardly anyone goes there so you can have it all to yourself most of the time. 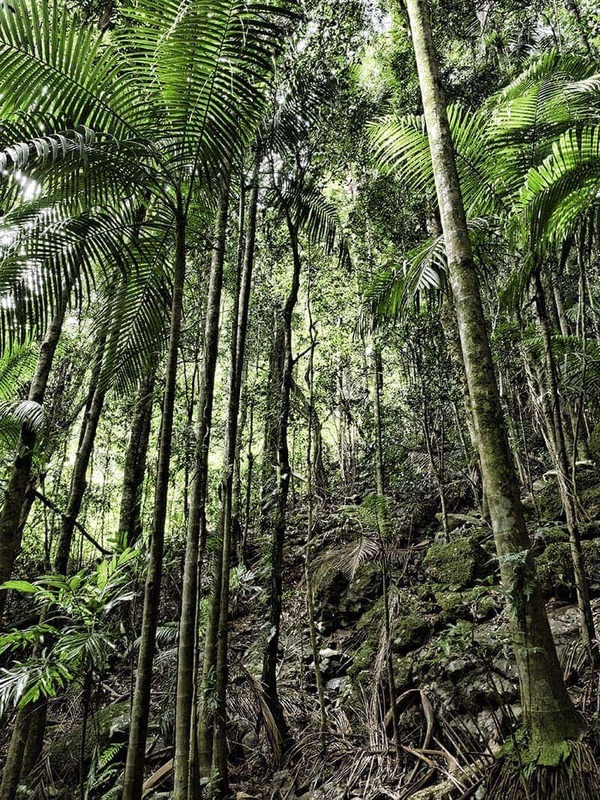 Becoming a World Heritage area isn’t easy, it takes millions of years. It started with the eruption of Mt Warning 23 million years ago which resulted in layers of volcanic rock forming. 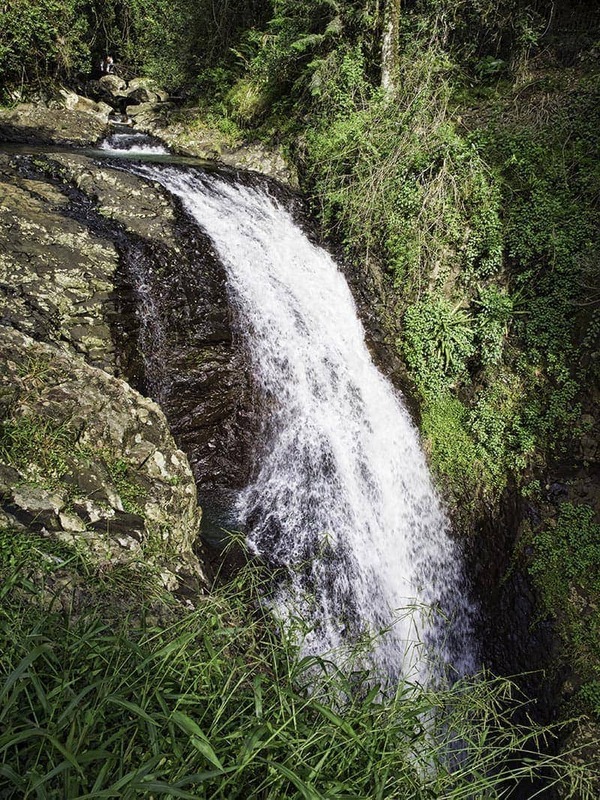 A swiftly flowing stream through the Niminbah Valley dropped over a waterfall at the location of the Natural Bridge. Over time a softer layer of volcanic rock at the base of the waterfall was cut away by the force of the falling water forming a cavern. At the same time a deep pool formed at the top of the waterfall resulting in currents of circulating water that in time eroded through the rock layer forming a hole. The water now plunges through that hole into the cavern below before continuing it’s flow onward. 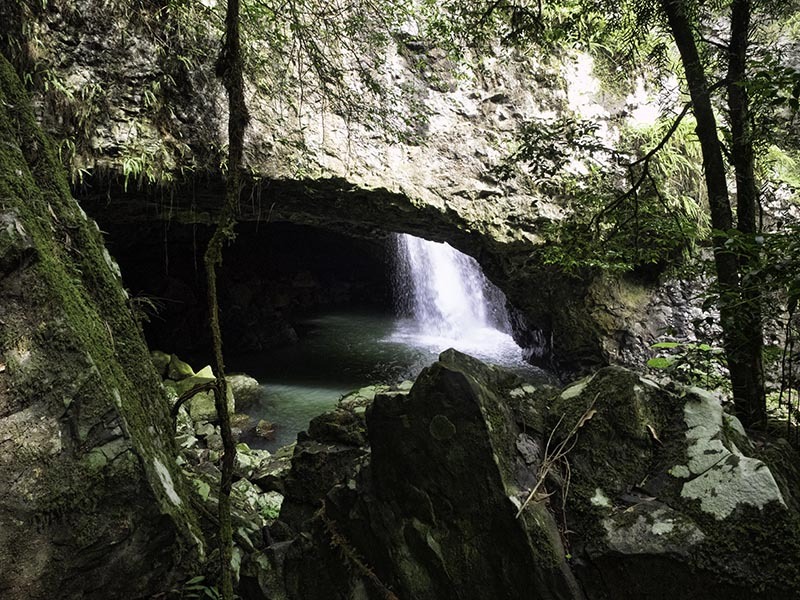 The Springbrook National Park and Natural bridge is a about 1.5 hours drive from central Brisbane or 50 minutes from the popular Gold Coast beach of Surfers Paradise. 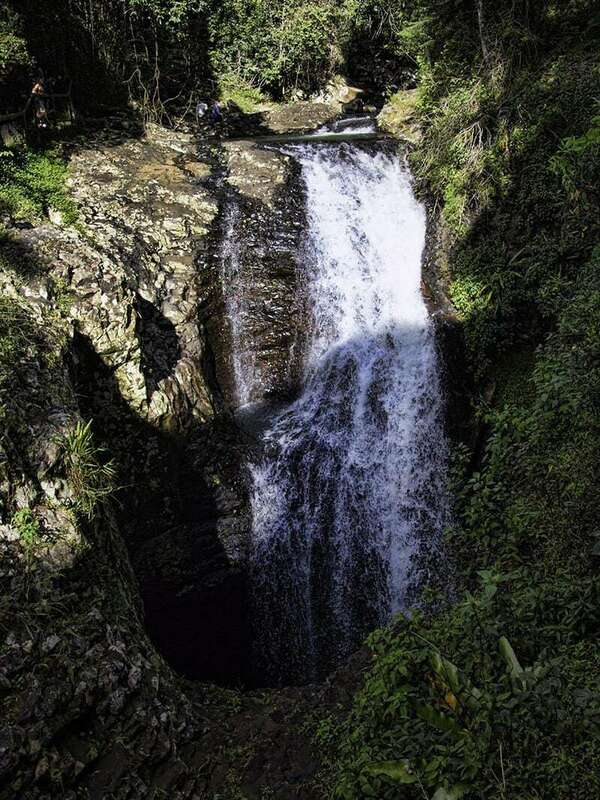 If you’re travelling down from Brisbane consider combining a visit with other popular locations including the Hinze Dam, Binna Burra, other walks in the Springbrook National Park or some time on the Gold Coast beaches. You’ll also find that the local cafes make a great cup of coffee and delicious home-made treats. There are toilet facilities, information boards, carparking and limited picnic space at the Natural bridge. No fees or charges apply to use the park although fines may apply under the Nature Conservation Act for failing to stay within the clearly marked area. 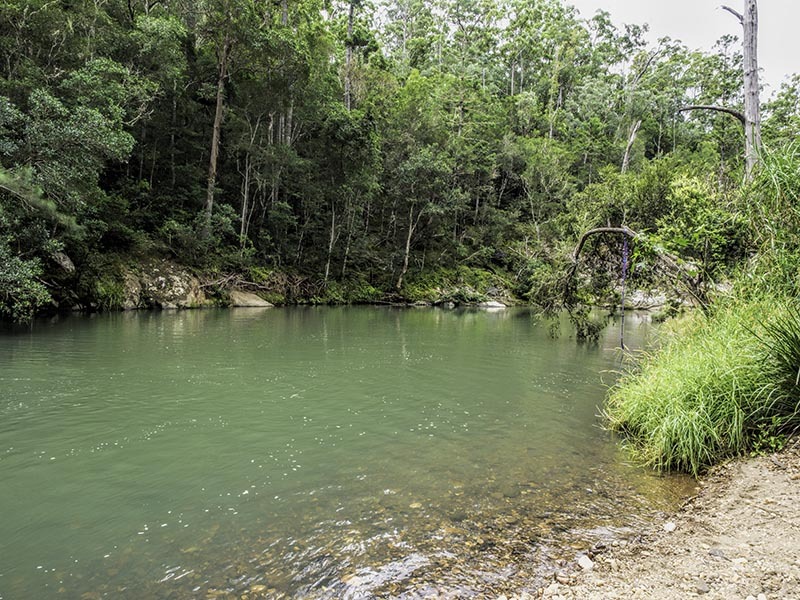 Additional picnic facilities and river swimming are available within minutes of the Natural Bridge at a public park and the forest park rest area. Well this looks like one more thing I need to add to my Australia list! Looks beautiful. We have a lot of waterfalls in the Philippines as well, but none with glow worms (or none that I know of). I didn’t even know there were glow worms. Haha. And I share the general disappointment of not being able to swim there, but how can one argue if it’s for such a good cause. Will take note of this if/when I visit Australia. Btw, do you actually get to see the glow worms in the night even if you can’t get too close? We didn’t see them this trip so we must go back with the camera and tripod, they hang from the wall and ceiling so you do get pretty close to them. You just have to hope to have no one messing around with a torch when you are there, you need to cover the lense and keep it pointed down when you are close to them or they think it’s day time and turn off their bum lamps. Wish I get to visit Australia one day! Would be a dream come true for a biologist. Looks absolutely stunning! beautiful pictures! I’ve always loved natural bridges. Beautiful photos! I never knew about this place when I was in Australia, what a shame! What I love most about Australia is the diverse and unique wildlife! Hi Stephanie, we are very lucky to have so much unique wildlife even around some of our bigger cities. I hope you make it back here some day, it is a huge country to see in one visit. I love waterfalls! And wildlife, what a great added bonus. Too bad swimming isn’t allowed, maybe to much current? Hi James, thanks for visiting the site. The only reason swimming isn’t allowed is to protect the wildlife especially the glow worms. They are most concentrated on the cave ceiling and walls but they also live in the creek embankment and surrounding rocks and vegetation. When people clamber through the area to get to the ponds or touch the cave walls and embankments when swimming they crush and kill the glow worms or adult flies / eggs that will produce the next cycle of glow-worms. WOW, this is a stunning place to visit. Good to know there is a place to swim – eventually! What a stunning place and a great wildlife photography, too. Hiking along with these kinds of views sounds exactly like my kind of day! Thanks for the great directions too.